Making fairy wings using two hangers, a pair of tights and some duct tape turns out to be a very easy and cheap project! 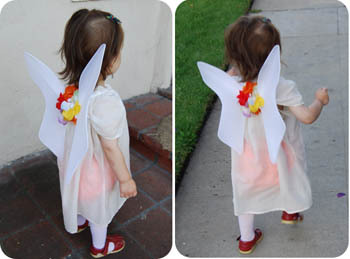 These wings can be used as part of a fairy costume or angel costume and using two hangers is the ideal size for beginning walkers to age five. I found two "throw away" wire hangers from the dry cleaners and purchased a pair of white tights and a roll of duct tape and a fake flower lei from my local 99cents store! These fairy wings cost me $3 total! If you haven't turned to your local dollar store for crafting supplies (the only thing they are good for in my opinion) go check it out, you never know what you might find. First is the most difficult part of this whole project...you need to remove the curved hook of the hanger. This is why it is essential to pick cheapie dry cleaning style hangers that bend easily. Don't go with heavy duty wire hangers, you'll never get the wire to snap! Slowly bending it back and forth until it snaps off. Remove just the curved part, leave some of the "neck" as shown below. Then tape together with duct tape. My duct tape shown is white because that was all I found, but any color is fine, it will be completely covered in the end. Now take both wings and bend them together as shown in the first photo below. You can't have wings that lay flat, so this gives them the proper shape. Bend your wing shapes, and make an effort to match both sides as best you can. I started by pinching in the upper/lower part of the wings and then shaped from there. If you purchased tights, you'll need to cut off the legs right at the crotch. For these wings, you really will only need (assuming you are using adult tights) about the knee down, but cut at the crotch first to be safe and then cut the excess after. You will also need to reserve two segments of the leg (two tubes or loops) for the arm loops shown two steps down. Once both wings are covered, pull the ends tight, even out wrinkles and then tie ends in a knot. This will be covered by ribbon or flowers. Now cut two segments at least a few inches thick of your left over legs. Stretch these loops all the way over the wings to the center. These are the arm loops that baby's arms go through for wearing. Finally, you'll want to put something decorative in between the wings to cover up the knot you tied. Ribbon wrapped around or flowers works well. I wrapped a fake flower lei twice around and then cut it and tied the ends together. Of course, you can embellish from here, add glitter, beads, trim around the edges, etc. Have fun! 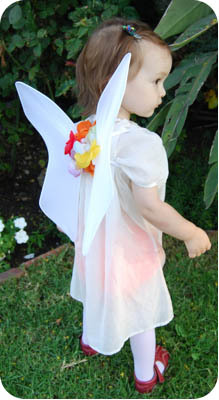 And remember, making fairy wings isn't just a Halloween costume project, fairy dress-up is fun all year 'round! Go to the Make Baby Costumes Section for more project ideas! Back to the top of the Making Fairy Wings page.